Three weeks of vacation. Three separated weeks of vacation. Three completely different weeks of vacation. Finally we can look forward to 2008. Yes, we just returned a few days ago from a trip to Minnesota and Ohio to visit family. I'll try not to allow this one to get as long as the last travelogue. The first week of vacation, to Nebraska was, you might say, on business. The second, to Washington, you could characterize as sport. The last was family. September 2 after church services here we drove to St. Paul, MN, to daughter Merrily and her husband Hans' home. 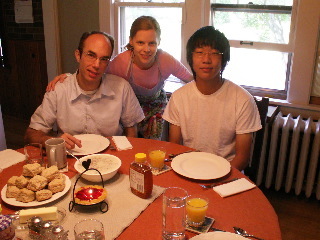 They and their current Korean English student, Tae Sik, welcomed us late in the evening. We thoroughly enjoyed spending Labor Day with them. One highlight of the day was the Bean Factory coffee shop just a few blocks from their place. As we enjoyed our coffee outside, we visited and yelled at each other as the airliners flew over. Well, they have to fly over somebody when they land, and since one of their usual runways is being rebuilt . . . you know how that goes. You might as well yell at the coffee shop as elsewhere. In the afternoon we went to Jim Laab Pianos to shop for a digital piano. Ours has developed a problem. We could order one online, but it's really nice to be able to see, touch, and hear one before you buy it. So the digital pianos there got a workout, and so did some of the acoustics. Enjoyed seeing some brands I had not seen before. Did you know that Hyundai makes a piano? That evening we enjoyed a Korean menu. And all of us ate it using chop sticks. Some of us were more adept at this skill than others--you can guess which was who! Well, it did make the meal last longer, and I guess that's good. Tuesday we flew to Columbus, OH. And we have to say that the airlines were on time and delivered us as well as our luggage just like they said they would. Very pleasant. 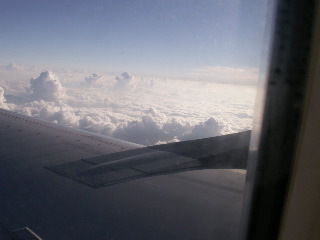 A nice day to fly. Renessa and the-almost-month-old Winslow greeted us at the airport and took us to their home. After a while we walked to a nearby library to check out some mystery (Rumpole at the Bailey, Miss Marple, Poirot) videos to watch. The library was very nice and according to reports has won some prestigious awards. Some other libraries could maybe learn something useful from them. Winslow is an energetic little guy! At one month he works his way from one end of the basket to the other. 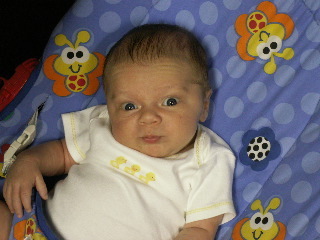 He almost flipped himself off my lap once by pushing against my stomach with his legs. He will probably be a track star like his parents. We were called into duty holding him, and, I must say, it was a pleasant duty. 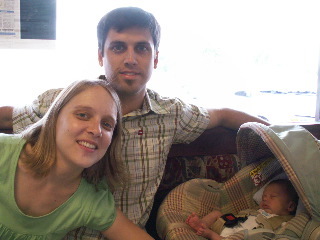 That evening we went out to Graeter's for ice cream. What a place! Graeter's makes their own ice creams, and they are rich--I mean the ice creams. I suppose the company is also. But while eating there we heard some bag pipers piping in a nearby church building, so we went over and were entertained by their rehearsal. It was the first time I have had opportunity to watch pipers from a small distance so I could actually see what they were doing. Of course, you could hear from a great distance what they were doing. Wednesday Ruth baked caramel rolls. But instead of eating hers immediately we enjoyed a bakery, La Chatelain. We don't have bakeries like that here, so it was fun to sample their croissants and turnovers, all very nice. I have meditated recently on the place food has in our lives. It is a necessity, and it can also bring much pleasure. As a gift of God He certainly deserves our thanks for it. 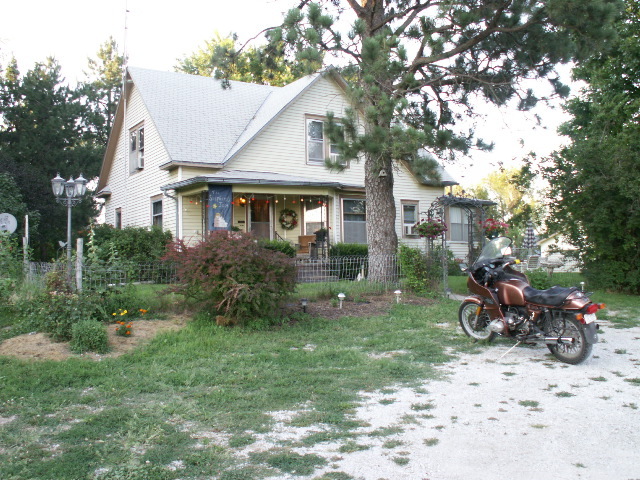 That evening we dined in the home of the Grimes family who would love to move to Montana. We report a wonderful time there. They have five children, who obviously respect their parents and love each other. It was refreshing to see them and to get acquainted. They are welcome to come to Montana as soon as possible. I suppose you could call Thursday guys-out day. Sy and I went out for breakfast to First Watch. You familiar with that restaurant? Neither was I, but people thereabouts certainly are. I had the Southwestern Eggcrepes. You should try them, too. After that we went to a Grace Brethren church (related to the home church of Sy and Renessa) for licensure exams. No, we weren't taking them; we were listening to others being interviewed. It was very interesting. I might have answered a few questions differently, but I tried to put myself into the place of the young men being interviewed and then realized that they were doing very well. After that Sy and I visited the American Motorcyclist Association Museum. One floor is maintained pretty much with permanent exhibits, but the upper floor receives a new exhibit annually. This year the exhibit accented motocross bikes. That genre is not my most favorite, but it was interesting to see the actual bikes ridden to national championships by some of the names I knew. That evening we dined at the Anatolia Cafe which has the Turkish menu. We had the family plan and were able to taste several meats (lamb is good). 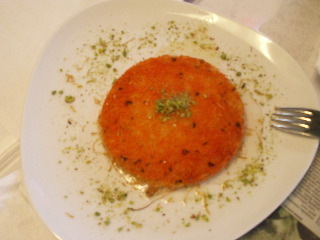 The desert I cannot even describe, but it included shredded wheat and honey; it was every bit as good as baklava. Friday I joined in the house cleaning (Ruth had already been helping Renessa with that) by spending a few hours manning the Rug Doctor. Those carpets did look better afterwards. Later we walked to Piano Warehouse to sample more digital pianos. We appreciated the shop owner's knowledge and willingness to share it. Sy and Renessa wanted to take us to a place called Cafe Mozart for a dessert, but it happened to be closed. So we returned to Graeter's where we knew we would not be disappointed. 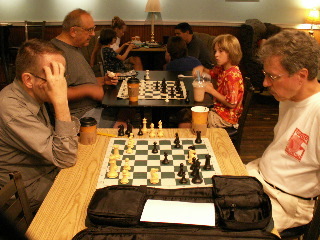 When at Graeter's we noticed a sign on a nearby coffee shop announcing friendly chess at Scotty's coffee shop Saturday 9 AM until noon. Well, one doesn't run across that just every day, and when you are on vacation, what could be better? So Ruth and I walked there Saturday morning to enjoy coffee and chess. I met friendly chess players there; I beat one and lost to another, so it turned out about even. Most of the players were grown men, but a small fifth-grade boy came, too. Size and age can be deceptive, because he was the best player of all and didn't even draw a sweat. Let me adjust that, the people he played did sweat, but he didn't. We had to leave by 11 AM because we were off to Mt. Gilead (still in Ohio) to visit Sy's parents. We haven't been together with them often, but we enjoy them every time we are together. We have lots to visit about and have many of the same interests. We had lunch downtown and then went to see their new house, garden, etc, and to see pictures related to his work in Africa. The time went quickly. Sunday morning we were glad to be able to accompany Sy and Renessa to their home church, a church of around 2000 people. We probably would have gotten lost if we had not been able to tag along with them. (Well, I suppose we would have asked direction eventually.) But it is different when you are used to a church where you know everyone. Late afternoon we headed back to the airport and arrived in St. Paul about 9:30 PM. Good plane service again! One last treat. We stopped on the way home Monday at Sandy's Donut shop in Fargo. I located that via internet research. We could have stopped at a Krispy Kreme not far away, but this was better! I'll say that we splurged a bit there, but we hardly ever get to a donut shop. And since it was technically in the afternoon (noon for us), we got fifty per cent off. Why, if we had told Sandy how old we were, we might have had the other fifty per cent knocked off, too. But respectability counts for something, so we didn't bring it up. We stopped in Jamestown for oil and a filter for The Hooligan. When we arrived home, many telephone messages and emails awaited us. Some urgent ones asked us to call our dear friends whose husband and father is dying of cancer. When should I come? "Right away" was the answer. So we went out there (thirty miles) that evening yet and stayed until late. It was a very important visit. It was ironic in a way. One of the biggest treats of the trip was to hold Winslow, a new little boy. We enjoyed him to the full. And at the other end of the trip a fifty-two year old man after five or six years with cancer now in the valley of the shadow of death. We know him well, and we can think of many reasons why he should continue to live and be a part of the community. But he knows that Jesus Christ is the resurrection and the life, and his faith is in Christ. And he will soon be delivered from the world of evil and curse and death. The length of life is relative. Life here is like a trip. But to arrive at the intended destination, you have to have connections. We hope that you have the right connections. 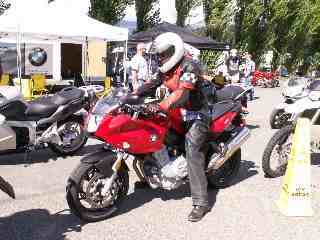 Yes, this year I went to Sportbike Northwest in Stevenson, WA, again, but this time I brought Ruth along. Now I don't expect her to ride on the back of a motorcycle (so far she doesn't want her own) 500 miles a day for two days going out and and two days coming back. So we drove the pickup and trailered the bike out. We were blessed with great weather for this kind of trip. We were places where people would have preferred rain to water the dry ground and to suffocate fires, but we experienced mostly sunshine. The clouds we did see did not drop rain. We would have gladly accepted rain for the sake of others. The first night we camped (really pickup-boxed because on this kind of trip we sleep in the pickup box which has a topper over it, so you understand what I mean when I say "camped") in Deer Lodge, MT. This little town is famous for the State Prison, but we managed to avoid that facility. We are not highly 'wanted' anywhere, I guess. That evening we enjoyed a rousing game of badminton. We kept to the interstate as much as possible. Our pickup is a 1993 Mazda, and, though it runs well, it lacks a little oomph when going up long, steep hills while pulling a loaded trailer. Interstate was a better choice because of the hills being somewhat less extreme and because towns are only a scene as you race by--don't have to slow down. Tuesday morning, August 21, we drove to Missoula where we enjoyed breakfast at the Shack Restaurant. We were informed about this restaurant in Via, the magazine published by AAA. This place is well known for their pancakes. I had the whole wheat and honey, and Ruth had the oat bran. I have never in my lifetime (only one I've had) seen such a long and varied list of omelets. So little time and so little capacity! By night time we had settled in at the Peach Beach Campark about twelve miles south of Goldendale, WA. Can you guess what features this campground provides? Well, think about it a bit. 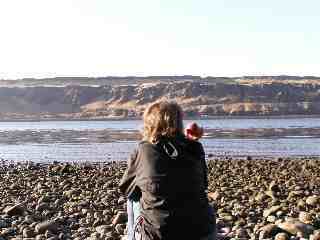 It is snuggled in right beside peach orchards and right on the shore of the Columbia River. We would recommend it, but they accept reservation calls only for two hours on Tuesday (sorry, I can't remember which two hours they are). By the way, the peaches were very good! Wednesday we cycled to Mount Hood before beginning our day's ride formally. We dined breakfast at Shari's, a chain of restaurants in that area. Shari's has great breakfasts, some a little different than you can get around here. I had the Cinnama-sation Breakfast, and Ruth had the Country Benedict. We cycled from there to finish a tour around Mount Hood that I didn't finish last year. The instructions for the tour included a road that was not labeled as the book had it. But a visit to a fire station fixed that. We completed the ride and visited four or five water falls as well. Curves labeled 10 mph and 15 mph were uncommon to us, but we were glad for the advance notice. In the evening we drove the pickup to Goldendale where we joined the group wanting to look through the big telescope at the observatory. We all saw Jupiter with three of its moons and a portion of our moon (the telescope is too big to get all of the moon in its view). Then clouds clouded our view, and the astronomer decided that we'd have to give up stargazing for that evening. However, four of us hung around, and we discovered to our delight that clouds which move in can also move out. After that the stargazing became very interesting as our astronomer found one sight after another including binary stars, a nebula, and star clusters. Supper at The Sodbuster in Goldendale consisted of two very good garden salads with my Fried Chicken Dinner and Ruth's Patty Melt. Thursday we transitioned to Stevenson where we would "camp" the next three nights. We didn't use The Hooligan (our Buell Ulysses) at all that day, but I did demo three Triumphs--the Rocket III (2300 cc cruiser), the Daytona (675cc sportbike), and the Tiger (1050 cc dual purpose). Those three were as different as can be, but it was fun. Friday was the poker run in which we did not participate. Is a poker run gambling? Well, I recently read the official explanation. A poker run is gambling unless associated with it is some activity involving skill. So some poker runs have a dart throwing contest at the end. I guess it would still be gambling for me, since for me throwing darts is taking quite a chance! Instead in the morning we first rode the Mosier Loops tour over in Oregon. That was a nice relatively short ride. It is a road that is used for photo-ops with new sports cars, and we now know why. At noon we stopped at the Acre Organic Coffeehouse in Hood River. As we stopped two bikers pulled up and asked if we had been riding with a fellow who was hit by a car. Turns out someone on a Buell had been riding with him. We had not. It was the car driver's fault, but the cycle rider was the one who sustained the injuries that motivated his visit to the hospital. Taking this ride involved crossing the dreaded iron grate bridge twice that day. It wasn't as bad on The Hooligan as it was the previous year on the Turbo. But it was nice to get across so I could breathe again. That afternoon we took the longer Three Rivers Loop northwest of Stevenson. One of the highlights on this trip was a vista from which we could clearly enjoy Mt. St. Helens to the northwest. Also at this vista we visited with a cycling couple from Australia. Another highlight of the area was roads as corridors lined with very tall pines. In other places roads lined with other kinds of trees that actually met above the road creating a kind of tree tunnel. It was awesome! We ate that evening at the Big River Grill. Ruth had the Reuben with Salmon Chowder, and I had the Chef's Special Steak. The vegetables there were outstanding, and actually the remainder of the food was also very good. Saturday I took two more demo rides. The first on an Aprilia Caponard (I preferred the Tuono R, very like their racing bike, but it was scheduled until who knows when), and the second on a BMW F800S. The BMW is a new attempt at a parallel twin. Parallel twins were in style years ago and somewhat fell out of favor. It was nice, a bit odd as most BMWs are, but down on power in fourth and fifth gear. After that we rode to the Maryhill Museum where I left Ruth while I went on to ride the Maryhill Loops, probably the most famous ride associated with Sportbike Northwest. It consists of 3.5 miles up a very loopy private road built as a test for road building. It begins at the bottom of a huge hill and goes up in serpentine fashion. The road is rented for the day by Sportbike Northwest. To take some of the corners at 25mph is practically death-defying. There were two accidents there that day, one happening almost right behind me after I had ascended. That brought everything to a halt for a while. The bike that went down then was a mess, and the rider was moreso than he realized at first--he proceeded to hospital later that evening. 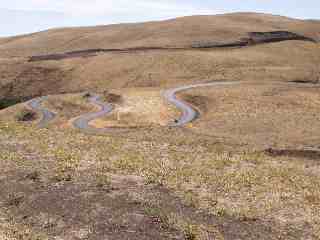 Personally, I thought the Maryhill Loops were overrated. After going back to the museum to get Ruth and spending some time there, we stopped at the Maryhill Church and the replica of Stonehenge that Sam Hill built. Then we returned to Stevenson. It was a very windy day in the Gorge, and we were against the wind all the way back to Stevenson. The wind surfers in the river seemed to use it to their advantage. Saturday, the rally provided breakfast and the evening meal. They were both catered and were quite good. The main dish in the evening was called something like paia (rice, meat, etc. etc.) and was made in pans shaped like huge woks about three or more feet across. It wasn't our favorite, but there was enough of vegetables, fruits, and ice cream with brownies to make up for it. We came away from the final meeting that evening with each a pen and with Ruth having had a cap (some boot company) land on her lap. Sunday we were up before most. We had loaded everything Saturday evening so we could get away quickly. We got down the road about 160 miles to Kennewick so we could attend the Calvary Chapel there. But first we had breakfast once again at Shari's (same chain as in Hood River) where Ruth had the Honorary Bacon Omelet and I had the Flat Iron Steak with stuffed hash browns. We enjoyed the church service which lasted, to our surprise, 1.75 hours. The message out of the first part of John 3 was excellent. It encouraged us on our way as we left and reminded us that you can have position, possessions, and influence without satisfaction. Satisfaction comes by being born again of the Spirit Who then enables you to produce the fruit of the Spirit. That is a satisfying, productive life. We drove purposefully on to Missoula, MT, where a room at the Gibson House B & B was waiting for us. This house had an interesting and varied history. The original owner lived in it only five years. The people who currently have it are the thirteenth owners. It was even a sorority house for the U of M for a while. It was huge and had four lodgings on the second floor. The owners lived on the third floor. When we got up in the morning, there was shortly a tray outside our door with blueberry scones and coffee. Later for breakfast we enjoyed huckleberry/peach pancakes and bacon in the dining room. The house had a yard that interested us; there were flower gardens, a gazebo, and even a chemical toilet. Taking care of a large house like that would be almost a full time job. There was a large deck adjoining the second floor (suite), a porch on first floor, and six huge pillars in front. We had the City Room, so we had a nice view of the city out our window, especially the lights at night. Forks under power. The gas gauge had been nearly on the bottom for some time. We had a sandwich and wrap in Miles City at Brewster's, a nice place which used to be a Hardees. Our prediction, which we is hope is wrong, is that that establishment will not be open long-- something to do with oddities in the presentation of the food and also the slightly high prices. short. Yet we have slept really well upon arriving home. The equipment worked well with only some minor glitches. 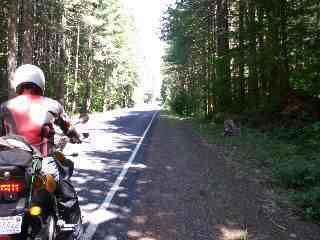 We put 2188 miles on the Mazda and about 600 on The Hooligan in the trees. The bikers were involved in something like eight accidents, but we were not. Occasionally we would meet another attendee and be surprised that there were not more accidents. But all in all most people were quite friendly. Maybe bits of this trip seem rehashed in that I attended that event last year. But this year was better in the sense that I had my favorite companion along, so there was good conversation at every stop. We are home right now for a crazy week after which we are off to Ohio to visit little Winslow and his parents (Sy and Renessa). This time we are involving wings instead of just wheels. Gotta take a sentimental journey, dah dah dah dah dah dah dah. Some of you may be too young to remember the song, but I enjoyed playing it in our WPHS stage band over 40 years ago. Yeah! that's nostalgia! I still know how it goes, and now I also know what it means. Our major purpose on this trip was to prepare for a reunion of the currently living members of the Helmuth Penner family. 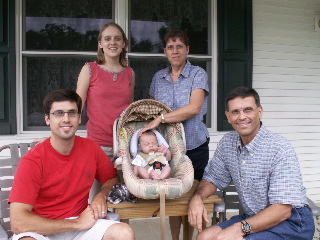 This reunion is to happen in 2008 in and around Beatrice, NE, where Ruth and her brothers grew up. So, prepare the bike, and off to Nebraska. We left about 7:40 AM Monday, July 9. We stayed near Hot Springs that night with friends whom we had not seen for maybe thirty years. For a time I was pastor at the church in (not near Hot Springs) South Dakota where the bride grew up. I served as the officiating pastor at their wedding. Seeing them in their environment working in the medical and insurance community, ranching, working in their local church and a local Bible school, and catching up on the news was certainly a treat for us. They were concerned about the fires in their area, and they had reason to be. The location of the fires was such that we ourselves were not impacted by them. The aged beef kabobs in the evening and the waffles and sausage in the morning were right on target! 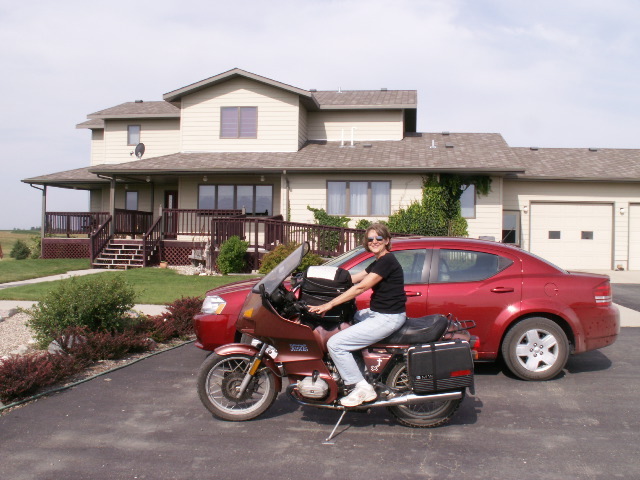 The next day we rode on to the Ord, NE, area. Riding through the Sand Hills is a pleasurable experience, especially if you enjoy boxing. The day was fairly pleasant, but it was windy. I suppose the nature of the wind there is determined by the hills, of which there are many and of which many are small. The wind seemed as a sparring partner. Jab, jab, jab,...POW. And then repeated with varying rhythms. But our old Beemer handled it well. The evening meal in Ord was delicious at the Mexican Cafe even though the construction in the middle of town made getting a parking spot nearby a challenge. That night we stayed at the Shepherd's Inn B & B after some difficulty finding it due to paucity of accurate instructions. It was an all around pleasant experience, and part of the privilege was paying for it. If you pass through Alliance, that railroad town, you should really stop at the bakery downtown. They have huge rolls, and they are known even up to Alaska for their bismarcks. They make 1100 to 2000 bismarcks twice a week. The Beemer managed its best mileage of the trip Wednesday; it was nearly fifty mpg. Can you believe that Nebraska has a fifty-five mph speed limit on some roads? There is a reason for it, even though it seems that one should hop off and run alongside. The vegetation in some areas comes right up to the road with virtually no shoulder, thus a lower speed is appropriate, especially to avert contact with certain animals that may appear suddenly in one's line of travel. So, mileage really is related to speed? After french toast and an egg in a nest, we resumed the journey. We went way back in time at the Homestead National Monument near Beatrice. Hiking trails and a new Heritage Center--which some say is shaped like a plow share--with its hands-on exhibits make this a special place. Those disputes between the open-range ranchers and the incoming farmers got fairly intense. Then we stopped at the Mennonite Church's graveyard where the bodies of Ruth's parents are interred. It took us a while to find them. But really the assignment was easy. You just walk along every row of tombstones and read every name until you find the right ones. It didn't help that almost half the tombstones said "Penner" them. Even more than one "Marie Penner." But we finally succeeded. After the must stop at the Runza Restaurant (runzas are a Nebraska special), we checked in at the Carriage House B & B for the next three nights. Let me sum up our stay there by saying it was quite nice. Drawbacks were that the owners do not live there and that the air-conditioning vent is positioned right above the bed. But the food was good, our hostess was an excellent cook/baker, and she became somewhat of an angel for us as you will discover later. Let's see, now, this must be about Thursday. We are at our destination for researching and planning next year's family reunion. All is set. After a breakfast of strawberry french toast and sausage, we were off to the library to obtain information about using their meeting room. The Beemer acted funny there by not wanting to start, but then it started as usual, and we were off to Chatauqua Park to evaluate the possibilities of using one or part of a shelter there. By the way, the park is a lovely one, and if you chance to Beatrice, you should at least drive or even amble through it. When we were ready to leave, the Beemer would not start. The lights would come on weakly, but nothing else. I need to inject here that if you ever break down, please do it in a park. It was a lovely place with shade, restrooms, and people with cell phones. At this point our attention shifted to the issue of transportation while the reunion was hastily shoved out of sight. Most of the rest of that day was dedicated to the ailing Beemer. I can't possibly recall all that took place, but I will say that everyone in the vicinity was most compassionate and willing to help. This began with two men who had cell phones: one was mowing the park at eleven mph on his diesel-powered mower, and the other was biking through the park for exercise. Eventually a large tow truck with two men arrived. The power pack indicated that the bike would start, but it would not keep running without the power pack. Either the charging system was bad, or the battery had a short. They said they'd be back after lunch, hopefully with a new battery. They were. With the new battery, the bike would start, but their voltage tester indicated that the charging system was bad--it could not charge as much as twelve volts, and it should have even charged more. Some phone calls indicated that no one in Beatrice works on bikes; after all, it is a city of only 13,000 people. So we tried the Lincoln phone book. Star Motorsports sells many kinds of bikes including BMWs. Great! We'll send the bike the forty miles there. So we called them. Actually, they have not sold BMWs for years, and they do not work on them. The closest BMW dealership is Omaha, but there is a BMW tech at another cycle establishment in Lincoln. I have a policy with AMA Motow for just such situations, though it is the first time in 70,000 miles that I have ever had a breakdown away from home. And when it's at home I fix it myself. It's Thursday, and I'm thinking that someday we may get home; when we do, I will write a travelogue, and it will sound much like the travelogues Lyle writes (they break down every time they go to Colorado). So we called AMA Motow. They asked me to wait a bit, and soon they said a tow truck would be there in about twenty minutes to deliver the bike to Lincoln. Now we are getting somewhere. Sure enough, soon another large tow truck arrived. We assisted him slightly in loading what looked like a very small bike (too bad I didn't get a picture of that) onto about the middle of the flatbed of a very large truck. And the bike disappeared. Would we ever see it again? I'm getting ahead of myself. I hate it when that happens. Then I have to slow down to catch up. Anyway, actually we left with him. Someone located for us the one vehicle that could be rented in a city of 13,000 people, a Montana van. I think it was a Chrysler product, but the "Montana" was acceptable. So we had wheels from the GM dealership. Now we could get back to the reunion. That evening we had pizza at Valentino's, a famous Nebraska pizza restaurant, and a candidate for some meals at the reunion. Later we drove to the Villa to visit Ruth's two aunts who will both be arriving at the ninety-year milestone within the next few months. That visit was informative and just plain fun. These gals are blessed with fairly good health, a good sense of humor, and great minds. They even gave us some help planning the reunion. It looks like some of it will take place at that very facility, which has a lovely meeting room which can be used for such events. Beatrice seems to us to be a city which provides well for the elderly. Many cities do not have the proper facilities for all stages of growing older, but there there are options, and the place these ladies live is really well planned. Where can we sign up? Friday (after egg casserole and monkey bread and a watermelon ball coated with yogurt and blueberries) was dedicated to motoring around Beatrice in Montana (doesn't that have a nice ring? ), but first I called Lincoln. The responder said they were just then putting the bike on the stand and they believed the bike would have either a bad rotor or a bad rectifier. Good. Glad to know they are on the hunt. We didn't want to eat all the reunion meals at Valentino's, so we shopped around. We stopped at a steak house. Nice, something like Bonanza. But the lady said, "We won't be here next year." What? She was selling the place, and it would become something other than a restaurant. Which meant that there really is no family restaurant left in Beatrice, at least none with a room set aside for groups, but there may be a dozen fast food places. Wonderful! We may have to eat more than one meal at Valentino's. We ate at the steak house that evening. I had the sirloin, and Ruth had the chopped steak. Very good. But they won't be here next year. We also drove Montana down to Odell where Ruth went to high school and took the driving tour around town. The school has recently merged with another school. Memories. And changes. But the little town looked nice. We stopped at the farm where Ruth grew up. No house. Just a hole where the partial basement was. Everything was overgrown. The evergreens they used to trim were huge now. There were trees where there hadn't been. She found some landscape rocks and some cement steps. It was so different. It's people that make a home and a history, not what is left when they leave. The windmill had not been moved. The buildings and grain bins were different, but nothing there is really being used anymore. While at the Chamber of Commerce's information center, we were perusing some old plat maps of farm land when Ruth practically ran into a lady she did not know but who had heard the name Penner. On a whim, maybe an educated whim, she asked Ruth if she had ever won a Cosgrove music scholarship to attend a music camp at the University. Turns out Ruth did, over forty years ago. Well, they didn't know where Ruth was, and could she send an article about what she has been doing since that time. They want to know what good their scholarships are accomplishing. Amazing concurrence, isn't it? We had to find lodging for the reunion. Check! We had to find eating facilities. Check! We had to find places for the group to meet. Check! We had to plan for a tour: farms, churches, schools. Check! Now all we have to do is get reunited with the Beemer. By the way, how is the work on the Beemer coming? At 2 PM Friday I called. The responder said the bike was ready to go. The rotor was bad. A new one from Kansas City was too expensive, so they found a used one close by in a wrecked bike. The bike was ready to go! Did you hear that?! How will we be reunited with the Beemer? Now there must be hundreds of people every day who travel the forty miles from Beatrice to the big city. The challenge is to find one who has room. We considered various possibilities. One of these that would not work was driving Montana to Lincoln and then coming back with Montana and the Beemer. Why wouldn't it work? Because, since Ruth was going to be only a passenger on this trip, she didn't bring her driver's license. So, we decided we would ask our hostess first. "Would you happen to know of anyone going to Lincoln tomorrow morning?" And she replied, "I am, and you can come along." Can you believe it?! I was wondering all along how God was going to work this out, and everything was moving along beautifully! Saturday morning we had peaches, whole wheat pancakes, eggs, and sausage. Those pancakes were fantastic! Really! Our hostess took us right to the Lincoln establishment. Our man there said, "You sent your bike to the right place." I guess we did. From the options we had at any given time, God gave us wisdom. Two of the fellows working there ride BMWs, and they liked ours. Some of you are wondering how we paid for all this. When we go on a trip, we usually take more dollars than cents. So the money ends up not being an issue. We are grateful! After attaching the luggage to the bike, I started it right up. We rode a few blocks on Highway 6, turned north onto I-180, went a short distance, transferred to Highway 34, and were on our way to Columbus. Really can hardly say we were in Lincoln--were there only about thirty minutes. That's ok since we had not planned to go there this time. We stopped at the hospital in David City to visit a friend who is ailing severely from Crohn's disease. We really wanted to see her, but we discovered there that she had been transferred to Omaha. That probably is not good news. We stopped at her house near Columbus, but no one was there. That was not a surprise since her roommate had called earlier to tell us they were in the process of moving elsewhere. We checked into the Super 8 Motel in Columbus about 1 PM and after resting and getting thoroughly freshened up, we walked the eighteen blocks to the wedding of a friend of ours by 4 PM. The parents of the bride were so surprised and happy to see us. We had returned the RSVP card, but we had left off the names and I had mailed it in June from South Dakota. We knew very few people there. But, surprise of surprises! a family of good friends from the 1980's and their two daughters were there. So after the wedding we invited them to our motel room where we visited one and a half hours before going to the reception. By the way, they gave us a ride, too. At the reception we were able to visit with some more friends from Columbus whom we met shortly before leaving there in 1990. And at the wedding we were able to visit a bit with the pastor and his wife, previous acquaintances also. So that mission, too, was accomplished. About 8 AM we rode out of Columbus Sunday after passing by the house were we lived for seven years. It still looks much the same, even the same color seventeen years later. We rode to Norfolk where we had breakfast at the Village Inn, one of our favorite restaurants. I had the Strawberry Crepes, which were outstanding, and Ruth had the Vegetable Skillet. After that we went to a church service. Attending a church service on a trip is always interesting. We have different approaches to this. This year the church was chosen by name only (which for now shall remain anonymous). I did, however, call to verify service times. We found the location without difficulty. The people were very friendly, and we assume they make it a point to greet visitors. An adult choir sang, and so did a youth choir. Accompanists played organ and piano. Alas, I did not check the brands of these instruments, though I wanted to. The piano was a grand. The songs were good, the Scripture could not have been improved upon, and there was good in the message. On the downside, the church obviously had a dress code which we did not meet (but they still made us feel welcome). Everyone obviously used the same version of the Bible. Our evaluation is that the text from which this pastor preaches may change from week to week, but the basic message does not. In other words, it doesn't matter what the text is. Such a great opportunity to explain God's Word to the listeners, and he didn't do it. But maybe the people like it so. Sunday was my worst day of riding, and that is because I contracted a good old Nebraska cold by the second day in Nebraska. It reached its worst Sunday, and I ached all over. But we had to move on, and we did. For sentimental reasons, even the cold seemed appropriate. All the vegetation seemed to exacerbate it. We angled up through South Dakota. We rode through Freeman, SD, and actually right past the hospital where Andrae was born. We passed through Bridgewater seeing the house we lived in there for three years and eight months and past the Zion Mennonite Church where I was plunged into the pastorate initially. We paused in Carthage for a brief respite and some shade. A lady exited the museum next door and invited us in. The building was unique in that the walls were built of straw bales, and it was nice inside. Glad we stopped. We continued on. We saw from a distance the Yale Bethel Church where my cousins pastored for many years. We stopped at the entrance to what used to be Byron Bible Camp and James Valley Christian High School. I have fond memories of the four summers I went to camp there. But some years ago the camp and the school were destroyed by a raging flood. This day the James River looked too mild to ever do harm. 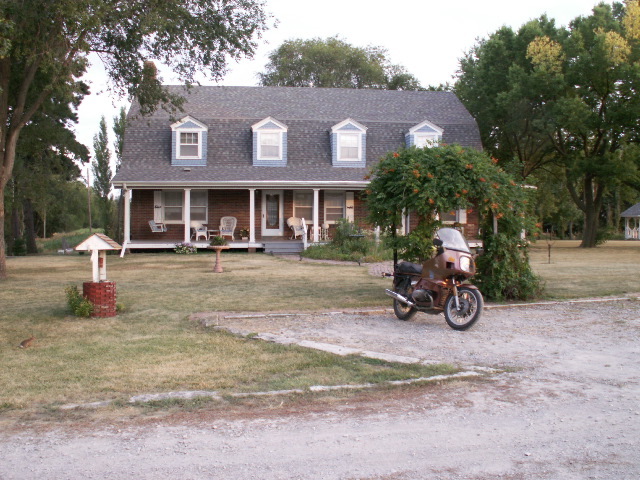 We stopped in Redfield at Subway to eat and continued to the Foote Creek B & B near Aberdeen. This B & B was built to be a B & B. It is a lovely place, and the host and hostess do a very good job of serving their guests. Honestly, I must say that I slept better there that night than I have anywhere in years. 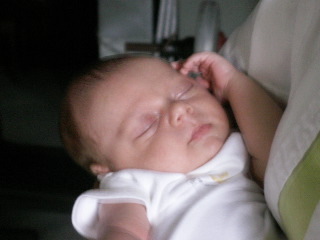 Ruth slept well, also, and later we evaluated why. There could be other factors such as tiredness and having a cold--but usually that just makes it impossible for me to breathe, so that I actually sleep worse. We think it was the quietness. We could not hear a train, or a semi, or a refrigerator, or even an air conditioner. So we were tired, and we put on a CD of relaxing music, and it was . . . so . . . . . . quiet. I had to put the CD on again in the morning, because I had heard almost none of it. 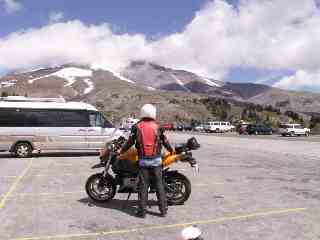 And in the morning I felt much better and once again ready to ride! Another couple was there all the way from California. They were visiting his mother who was one hundred years old! We had a nice visit over breakfast which included peaches with raspberries, toast, and a skillet or casserole of some kind. We planned to go home via Ellendale and Jamestown, then west on the interstate. But our hostess reported lots of construction that way. She showed it to us on the internet. We appreciated her helpfulness, and by her suggestion we decided to ride through the construction on Highway 12 going west instead! There was considerable from Hettinger to Gascoyne, but other than that we were glad for the redirection. It was more interesting than interstate, took us directly from Aberdeen, SD, to Baker, MT, and probably saved us a few miles. We stopped in Marmarth to see the fairly new auto museum there. I thought it was quite nice. Most of the exhibits are Fords, but some other makes are also represented. I really liked the model junkyard! We were considering where we should eat supper, but we rode into the driveway at home about 6 PM, so guess where we ate! 1746 miles. The Beemer missed nary a beat on the way home from Lincoln. But Monday afternoon the way home was hot. The tires got quite hot, but apparently the Bridgestones are built to take it. The Sentimental Journey is now a memory. Most of our objectives were accomplished. We missed no appointments. Until the next journey, keep the rubber on the road.